Released officially in the UK on cd and LP. Absolutely love this record. One of the best albums of the zeroes in my opinion. I do find it a pity that they feature an edit of Pogo on the vinyl version, I like the regular CD version better. 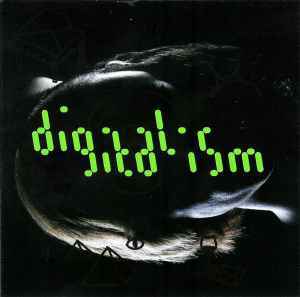 Rough around the edges, but stronger for it, Digitalism's debut IDEALISM treads after Daft Punk with eager steps. "Magnets," for instance, layers the vocoders under the influence of heavy electro, retaining a harmonic element all the while. "Zdarlight" carries an obvious homage to the Motorbass co-founder in the title and the driving beat, while "I Want I Want" lets the rock elements carry the energy. The acid electro is reminiscent a bit of Alter Ego, but their influences also range to New Order and LCD Soundsystem on "Pogo." They bounce back and forth between rock and electronics, ever restless, and that perhaps keeps the album interesting. The chanting on "Homezone," for instance, shakes up the proceedings, while "Echoes" takes things back out on the electro note. Digital, yes. Ideal? Not quite, but getting close. Raw, energetic, clever. Reminds me of my first time listening to Daft Punk's Homework. Clearly a major influence on this production duo's work. At times they pull out the guitar and it has an LCD Soundsystem feel to it. Recommended.